The well-type ionization chamber has been designed for convenient use in brachytherapy source strength calibration. The chamber has a volume of 240 cm 3 , weight of 2.5 kg, and is open to atmospheric conditions. The well-type ionization chamber dosimetric characteristics such as leakage current, stability, scattering effect, ion collection efficiency, and nominal response with energy were studied. The evaluated dosimetric characteristics of well-type ionization chamber were compared with two other commercially available well-type ionization chambers. The study shows that the newly developed well-type ionization chamber is reliable for air-kerma strength calibration. The results obtained confirm that this chamber can be used for the calibrations of high-dose rate brachytherapy sources. Source-based brachytherapy is a special treatment technique in radiotherapy that delivers a high dose of radiation to the target volume with encapsulated radioactive sources placed at a short distance from the target. The radioactive source is either implanted in the target tissue directly or placed at distances of the order of a few millimeters from the target tissue. Several photon-emitting radionuclides with mean photon energies from 0.021 MeV to 1.25 MeV and beta-ray-emitting radionuclides with beta energies ranging from 0.54 MeV to 3.55 MeV are used in brachytherapy. The accurate dose delivery to the tumor in brachytherapy depends on many parameters. Accurate knowledge of the source strength is one of the most important parameters in brachytherapy. There was a practice in the past to accept the source strength quoted by the manufacturer for the treatment planning without the verification of source strength. , Generally, the quoted source strengths by the vendors are with uncertainties up to ±10% that may lead to large error in the dose delivery. The independent calibration of the source by the user is required for clinical purpose. The recommended quantity for specifying the brachytherapy source strength is air-kerma strength (AKS). , AKS is defined as the product of air-kerma rate at a calibration distance, d, in free space, K(d), measured along the transverse bisector of the source and the square of the distance, d. The acceptable uncertainty in the determination of AKS is ±5%. However, a source calibration accuracy of ±3% with respect to the manufacturer quoted AKS seems to be reasonable in clinical use. AKS of a high-dose rate (HDR) brachytherapy source can be determined either by direct or indirect methods. The direct measurement of AKS can be done using a Farmer chamber and seven-distance technique,  whereas well-type ionization chambers are used for indirect measurements which are also called secondary measurements. ,, Goetsch et al. have established the standard AKS calibration for HDR iridium (Ir)-192 brachytherapy sources at the University of Wisconsin Accredited Dosimetry Calibration Laboratory (UWADCL). This calibration technique measures the AKS at seven-distances in air using graphite wall Farmer-type ionization chamber, known as seven-distance measurement technique. The AKS measured with this technique was used to establish the calibration factor for reference well chambers at UWADCL. , The well-type ionization chambers are used in general to determine the AKS in the clinical environment to achieve greater precision due to reproducible geometry. As the detection volume of the well-type ionization chamber is large, it produces high ionization current that can be measured with high precision. The ion collection integration time is very short due to the large volume of well-type ionization chamber that eliminates the leakage current. , Two types of well-type ionization chambers are used in the calibration of brachytherapy sources: High-pressure gas (argon) filled well-type ionization chambers and well-type ionization chambers that are open to the atmosphere. Griffin et al. demonstrated that the atmospheric temperature and pressure (kTP ) corrections do not fully compensate for the high-altitude pressure effects with air-communicating well-type ionization chamber at low photon energies in the range of 20-100 keV. With high-energy photons and beta emitters, the kTP factor is applicable in air-communicating well-type ionization chambers. The well-type ionization chambers are provided with a calibration factor for a particular type of source. The calibration factor is dependent on the source design compared to in-air calibration with Farmer-type ionization chamber. At present, calibration laboratories provide reference air-kerma rate (N RAKR ) calibration factor for the well-type ionization chambers with Ir-192 or Co-60 HDR sources. The use of well-type ionization chamber in the determination of AKS requires various dosimetric tests namely leakage current, long-term stability, ion collection efficiency, scattering effect, nominal response to energy, and determination of maximum sensitive position (sweet spot). 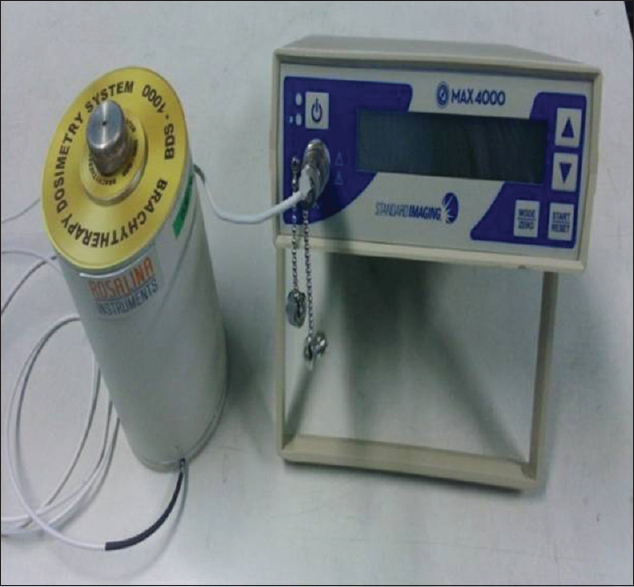 As well-type ionization chamber is recommended for the calibration of HDR and low-dose rate (LDR) brachytherapy sources, the present study focuses on the characteristic evaluation of the newly developed well-type ionization chamber (BDS 1000) designed by Rosalina Instruments (India) Private Limited, Mumbai, India. In addition, the evaluated characteristics of BDS 1000 well-type ionization chamber were compared with two other commercially available well-type ionization chambers such as HDR 1000 Plus (Standard Imaging Inc., Middleton, WI, USA) and BTC/3007 (Capintec Inc., Pittsburgh, PA, USA). The technical specifications of the newly developed (BDS 1000) well-type ionization chamber are shown in [Table 1]. A photograph of BDS 1000 well-type ionization chamber along with standard imaging MAX 4000 electrometer is shown in [Figure 1]. The source holder diameter is 2.2 mm for the HDR sources; the holder is also provided for the LDR source with well-type ionization chamber. The well-type ionization can be connected to any commercial electrometer through threaded Neill-Concelman triaxial connector. Gamma Med Plus HDR/PDR remote after loading (Varian Medical Systems) brachytherapy unit with a single high activity Ir-192 source was used in this study. The integrity of the well-type ionization chamber has to be verified as similar to the test performed for the cylindrical and parallel plate chambers used in radiotherapy. The visual inspection and the radiographic image check enable identification of the noticeable damages such as fractures/cracks or loose connections in the well-type ionization chamber. An Imaging (Panacea Medical Technologies Pvt. Ltd., India) radiotherapy simulator was used for the radiographic image acquisition of the well-type ionization chamber. The top and side views of the radiographic images were obtained with 70 kV and 50 mAs. 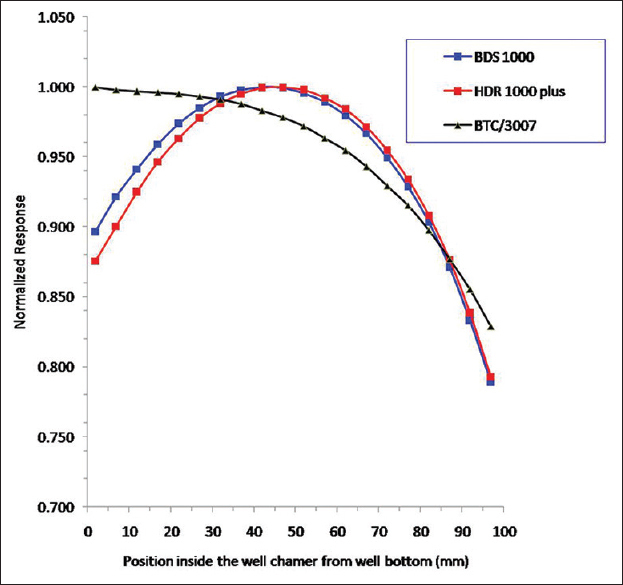 Chamber characteristics were evaluated for the BDS 1000 well-type ionization chamber. These characteristics were compared with two different commercially available well-type ionization chambers. They were HDR 1000 Plus and BTC/3007 well-type ionization chambers and the readings were obtained with MAX 4000 (Standard Imaging Inc., Middleton, WI, USA) and CNMC Model 206 (CNMC Company Inc., TN, USA) electrometers, respectively. The physical characteristics comparison of the BDS 1000 well-type ionization chamber with the other two well-type ionization chambers is shown in [Table 2]. The well-type ionization chamber was connected to the electrometer with the bias voltage "ON" for 1 hr to attain the thermal stability of the chamber and electrical stability of the electrometer, before the leakage current measurement. The leakage current (natural leakage) may occur due to dirty connectors, wet desiccators, insufficient time given for the instrument to stabilize, and no preirradiation dose given to the chamber. The leakage current for the chamber was tested for a period of 5 min with BDS 1000 well-type ionization chamber and it was also tested for the other two commercial chambers. The measurements were repeated five times for all three chambers. To verify the short- and long-term stability of the chamber, a stable source with reproducible geometry is essential. Ir-192 of half-life 73.8 days and Cs-137 of half-life 30 years were used to verify the short- and long-term stability of the chamber, respectively. The source was positioned at the most sensitive position in well-type ionization chamber with reproducible geometry. The measurements were carried out in the current mode to avoid the correction due to transit time. Each measurement was repeated ten times and the stability check was performed for the other two commercial well-type ionization chambers as well. Ideally, the measurements with well-type ionization chamber have to be carried out in scatter-free condition. To test the effect of scattered radiation, the response of the well-type ionization chamber in scatter-free conditions and then with scatter contribution was determined. The measurement was carried out in a scatter-free environment by placing the chamber on a cardboard box at a distance of one meter above the floor and away from the side walls to minimize the scattered photon contribution to the collected signal. To account for the contribution due to scattered photons, the response of the chamber was determined by placing the chamber directly on the concrete floor. Similarly, the scatter effect was also determined for the other two commercial chambers. To determine the position of maximum response within the well, the source was moved from bottom of the well in upward direction in steps of 5 mm inside the source holder. The mid source position at 2.3 mm was taken as the first dwell position as the length of the Ir-192 source is 4.52 mm. The sweet spot position was also determined for the other two commercial chambers. where I 1 is the ionization current at the bias voltage V 1 (nominal voltage) and I 2 is the ionization current at the bias voltage V 2 (V 2 = V 1/2 ). Aion was also determined for the two commercial chambers. where N RAKR is the air-kerma rate calibration factor for the field well chamber, and I ref and I field are the ionization currents obtained from the reference and field well-type ionization chamber, respectively. where kTP is the correction factor for the temperature (T) and pressure (P). T 0 and P0 are the reference temperature (20°C) and pressure (1013.2 hPa) at the time of calibration, whereas T and P are the temperature and pressure during measurement. As the BTC/3007 Capintec well-type ionization chamber is a sealed one, the pressure and temperature correction factors were not considered to determine the air-kerma rate calibration factor. To verify the sensitivity of the well-type ionization chambers with respect to the chamber volume, the nominal response of each well-type ionization chamber was checked at the maximum sensitivity position with Cs-137 and Ir-192 sources. The standard uncertainty (SU) observed for the stability of BDS 1000 HDR chamber with Ir-192 and Cs-137 was 0.23% and 0.2%, respectively. The nominal response of the BDS 1000 HDR chamber was 1.931 (nA/AKS) with Ir-192 whereas 1.635 (nA/AKS) with Cs-137 source. The ion collection efficiency, Aion was found to be 100%. The observed leakage current with BDS 1000 HDR chamber was 1 pA. The results obtained with the well-type ionization chambers, used in this study (BDS 1000, HDR 1000 Plus, BTC/3007) are summarized in [Table 3]. A combination of visual and radiographic image verification was useful to confirm the integrity of the well-type ionization chamber. No sign of physical damage was observed during the visual inspection or radiographic image verification. 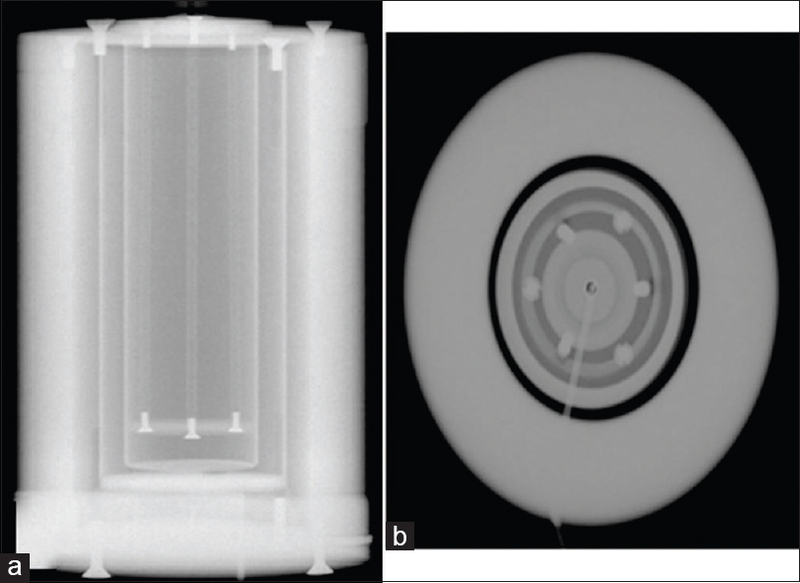 [Figure 2] shows the side and top view of the radiographic image of the BDS 1000 well-type ionization chamber. The leakage current for the BDS 1000 well-type ionization chamber was 1 pA, and was 0.5 fA for the HDR 1000 Plus well-type ionization chamber. No leakage was observed with BTC/3007 Capintec well-type ionization chamber. The electrometer background correction eliminated the leakage current during the AKS measurement. The Ir-192 and Cs-137 sources were used for the stability check of the well-type ionization chambers. [Table 3] shows the SU and standard error of mean for the well-type ionization chambers during the stability check. The chambers were found to have high stability during the measurements. As the well-type ionization chambers are very sensitive, it is important to avoid the contribution of scattered photons during measurements. It has been reported in literature that the chamber would overestimate the current by 1% when placed close to a wall. The effect of the scattering was found to increase while placing the well-type ionization chamber on the floor. The increase in the scatter contribution observed was 0.53%, 0.47%, and 0.25% with BDS 1000, HDR 1000 Plus, and BTC/3007 well-type ionization chamber, respectively. The obtained results were found to be well within the reported value. The source was moved from the bottom of the well with a step size of 5 mm in the upward direction inside the source holder to determine the sweet spot. The maximum sensitivity position was determined at 42 mm from the bottom of the chamber insert for BDS 1000 well-type ionization chamber, 47 mm from the bottom of the chamber insert for HDR 1000 Plus well-type ionization chamber, and at the bottom of the chamber insert for BTC/3007 well-type ionization chamber. The sweet spot of each chamber was indicated [Figure 3] by plotting the normalized response of the well-type ionization chambers versus the source position inside the chamber. Ion collection efficiency (Aion ) was found to be 100% for BDS 1000 well-type ionization chamber and 99.58% for HDR 1000 Plus well-type ionization chamber and 99.82% for BTC/3007 well-type ionization chamber. Goetsch et al. reported an ion collection efficiency of 98.9% with WC-2 well-type ionization chamber. The measured ion collection is in agreement with the literature value. The magnitude of the collected ionization current was not dependent on the sign of the polarizing voltage. The N RAKR was determined for the BDS 1000 and HDR 1000 Plus well-type ionization chambers by the cross-calibration method mentioned earlier. The cross calibration values of BDS 1000 and HDR 1000 Plus well-type ionization chambers were found to be 4.634 (±0.007) × 10 5 Gy m 2 /h/A and 4.545 (±0.002) × 10 5 Gy m 2 /h/A, respectively. The sensitivity of the chamber depends on the volume of the chamber and the energy of the source. The nominal response of the BDS 1000 well-type ionization chamber with a Cs-137 source was 1.635 nA/AKS and with an Ir-192 source was 1.931 nA/AKS. The nominal response of 1.636 nA/AKS and 1.972 nA/AKS was observed for the Cs-137 and Ir-192 sources with HDR 1000 Plus well-type ionization chamber. The observed nominal response of BTC/3007 well-type ionization chamber with Cs-137 and Ir-192 source was 11.48 nA/AKS and 13.87 nA/AKS, respectively. The nominal responses were found to be similar for a particular type of source with BDS 1000 and HDR 1000 Plus well-type ionization chambers. However, an increased response was noticed in BTC/3007 (sealed) chamber. This could be due to the increase in sensitivity of the sealed well-type ionization chamber. The newly fabricated BDS 1000 well-type ionization chamber has shown reproducible and consistent results when compared with HDR 1000 Plus and BTC/3007 well-type ionization chambers. The study indicates that the BDS 1000 well-type ionization chamber is highly sensitive, stable, and capable for the AKS calibration. The extensive work carried out suggests that the BDS 1000 well-type ionization chamber could be used for HDR brachytherapy source strength measurement. We would like to acknowledge ROSALINA INSTRUMENTS @ India Private Limited for providing newly developed BDS 1000 well-type ionization chamber to carry out this study. Goetsch SJ, Attix FH, Pearson DW, Thomadsen BR. Calibration of 192Ir high-dose-rate afterloading systems. Med Phys 1991;18:462-7.
International Atomic Energy Agency (IAEA). Calibration of Photon and Beta Ray Sources Used in Brachytherapy. IAEA TECDOC-1274. Vienna: International Atomic Energy Agency (IAEA); 2002. Vandana S, Sharma SD. Long term response stability of a well-type ionization chamber used in calibration of high dose rate brachytherapy sources. J Med Phys 2010;35:100-3. AAPM Report 21. Specification of Brachytherapy Source Strength. New York: American Association of Physicists in Medicine; 1987. Nath R, Anderson LL, Luxton G, Weaver KA, Williamson JF, Meigooni AS. Dosimetry of interstitial brachytherapy sources. Recommendations of the AAPM Radiation Therapy Committee Task Group No. 43. Med Phys 1995;22:209-34. Patel NP, Majumdar B, Vijiyan V, Hota PK. In-air calibration of an HDR 192Ir brachytherapy source using therapy ion chambers. J Cancer Res Ther 2005;1:213-20. Ezzell GA. Use of new re-enterant ionization chambers for the brachytherapy calibrations and quality control. Med Phys 1992;19:776. Baltas D, Geramani K, Ioannidis GT, Hierholz K, Rogge B, Kolotas C, et al. Comparison of calibration procedures for 192Ir high-dose-rate brachytherapy sources. Int J Radiat Oncol Biol Phys 1999;43:653-61. Stump KE, Dewerd LA, Micka JA, Anderson DR. Calibration of new high dose rate 192Ir sources. Med Phys 2002;29:1483-8. Rasmussen BE, Davis SD, Schmidt CR, Micka JA, Dewerd LA. Comparison of air-kerma strength determinations for HDR (192) Ir sources. Med Phys 2011;38:6721-9. Nair MT, Cheng MC. HDR source calibration methods and discrepancies. Int J Radiat Oncol Biol Phys 1997;38:207-11. Goetsch SJ, Attix FH, DeWerd LA, Thomadsen BR. A new re-entrant ionization chamber for the calibration of iridium-192 high dose rate sources. Int J Radiat Oncol Biol Phys 1992;24:167-70. Bidmead M, Briot E, Burgeretal J. A Practical Guide to Quality Control of Brachytherapy Equipments. ESTRO Booklet No. 8. ESTRO Mounierlaan 83/12 - 1200 Brussels (Belgium); 2004. Griffin SL, DeWerd LA, Micka JA, Bohm TD. The effect of ambient pressure on well chamber response: Experimental results with empirical correction factors. Med Phys 2005;32:700-9. Schüller A, Meier M, Selbach HJ, Ankerhold U. A radiation quality correction factor k for well-type ionization chambers for the measurement of the reference air kerma rate of 60 Co HDR brachytherapy sources. Med Phys 2015;42:4285-94. Podgorsak MB, DeWerd LA, Thomadsen BR, Paliwal BR. Thermal and scatter effects on the radiation sensitivity of well chambers used for high dose rate Ir-192 calibrations. Med Phys 1992;19:1311-4.